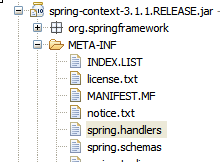 Spring Custom Namespaces provides a good way to simplify the xml files used to describe the bean definitions of a Spring Application Context. It is a fairly old concept, first introduced with Spring 2.0, but deserves being reviewed once in a while. Here it is configuring two beans - a handlerAdapter to handle the MVC controller flow and a handlerMapping to keep the mapping between request URI's and the Controller methods to handle the requests. the schema - which describes the structure of the custom namespace - the tag names, attributes, child tags etc. a NamespaceHandler - which creates the bean definition for the xml elements. However typically a better mechanism suggested by Spring document is to extend NameSpaceHandlerSupport and to register a series of BeanDefinitionParser(s) for the different xml elements supported by the Custom namespace(say annotation-driven, interceptors elements of mvc namespace). BeanDefinitionParser - create the bean definition for the specific element - here is where a line like <mvc:annotation-driven/> will be expanded to the broader bean definitions with actual bean class names. This however provides a good way to understand some of the nuances of how Spring handles things underlying a custom namespace.